Dedicated to the 100th Anniversary of the Birthday of Academician Levon Khachikian. The second International Conference "Readings of Narekatsi" was held at M. Mashtots Matenadaran on October 28-29, 2016. The launching conference initiated by the Director of Matenadaran, the renowned researcher and scholar in the sphere of Narekology, was held last year, in 2015. "We are pleased that today we are fully implementing the project he has planned in spring of this year,” mentioned the Acting Director of Matenadaran Vahan Ter-Ghevondian. The conference dedicated to the memory of Hrachya Tamrazyan started with a minute of silence. 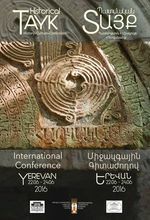 On June 22-24, the Mesrop Mashtots Matenadaran hosted an international conference with headline “Historical Tayk: History, Culture, Denomination” (see the program and abstracts of the Conference), organized by the Mesrop Mashtots Matenadaran and Armenian National Committee of Byzantine Studies, with participation of the National Academy of Sciences of Armenia. The conference brought together numerous prominent armenologists from Armenia and abroad: France, US, Russia, United Kingdom, Italy, Greece, and Netherlands. The opening remarks were delivered by the Matenadaran’s Scientist Secretary Vahan Ter-Ghevondyan, who conveyed the welcoming speech of the Mesrop Mashtots Matenadaran’s Director HrachyaTamrazyan, by the Head of the Department of Source Study and Old Bibliographical Monuments Erna Shirinian, the Director of the Institute of History of NAS RA, academician Ashot Melkonyan, and the Head of the Department of Armenian Studies at Oxford University Theo Maarten Van Lint. The conference particularly touched upon the issues of Chalcedonian Armenians' culture. The papers included topics related to different periods of the history of the province Tayk, the eminent figures of the province, as well as doctrinal issues. A whole series of reports were dedicated to Tayk’s architectural monuments of VII and X-XI centuries, their history and analysis of their artistic expressions. 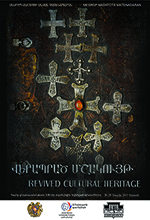 During the two days of the conference were presented reports in which was special accentuation about wastages of Armenian manuscript culture as a result of Genocide, were presented the new life of survived manuscripts, episodes and facts about crime that took place 100 years ago. The Chairman of Matenadaran’s Board of the Management Vigen Sargsyan read the greeting of the President of the Republic of Armenia S. Sargsyan addressed to the participants at the opening ceremony. His Holiness Supreme Patriarch and Catholicos of All Armenians Karekin II also sent his Pontifical blessing to the opening conference. 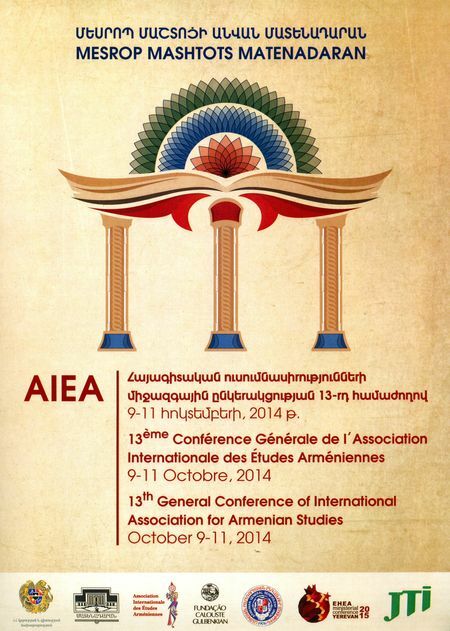 International Association for Armenian Studies carrying international great authority was founded in 1981 by initiative of armenologists Prof. Michael Stone and Prof. Jos Weitenberg. The Association combines over 400 armenologists and representatives of adjacent professions from more than 20 countries (since 1988 also from Armenia). 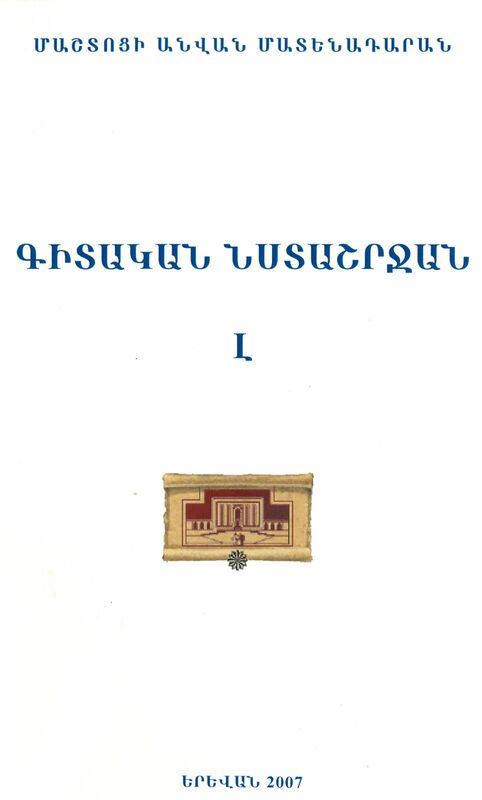 The basic goals of association: to stimulate Armenian studies’ development with his all spheres; to combine and put into the circulation the newest results of studies; to organize the exchange of experience of this sphere’s specialists. 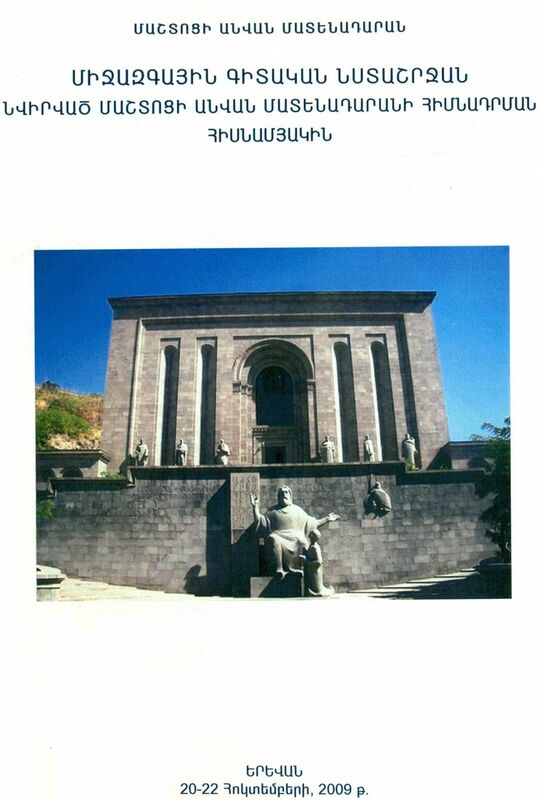 During the three days of Yerevan’s conference at three halls of Matenadaran (large hall, reading hall and virtual hall) have been read 70 reports. At the end of the session was discussion of reports read during the conference. At the closing of the conference, the president of AIEA Prof. Valentina Calzolari, the secretary Theo Maarten van Lint and the participants thanked the Matenadaran’s directorate and conference organizers for conference organization with a high level. New monographs and books will be born in the result of conference, because it became a platform for many new initiatives. As the “firstborn,” the collection of reports presented at the conference will be published. The next meeting of armenologists will be held in the same format in Oxford three years later in 2017. 24.03.2013 - The first conference dedicated to the research fellows of the Matenadaran was held on March 22-23, 2013. Over the span of two days, the research fellows presented reports in various fields regarding Armenian studies, from philology to Armenian miniature painting. The research fellows’ senior colleagues, also at the conference, welcomed the participants and their selected topics. The reports were actual, sometimes blossomed new questions which will be reflected in future works of the research fellows. In direct support of the young’s achievements, the director of the Matenadaran, Hrachya Tamrazyan, helped organize and run the conference. Afterwards, he rewarded all of the participants with valuable books. The Director also promised that most of the reports, presented at the conference, would be published. 23.09.2011 - On September 20-22, 2011, in the Matenadaran’s newly-opened building was held the First International Conference dedicated to Mesrop Mashtots’ 1650th birthday. The conference was attended by members of prestigious educational institutions and scientific centers abroad, and included nearly 30 famous armenologists: linguists, historians, art historians, and manuscript scientists. 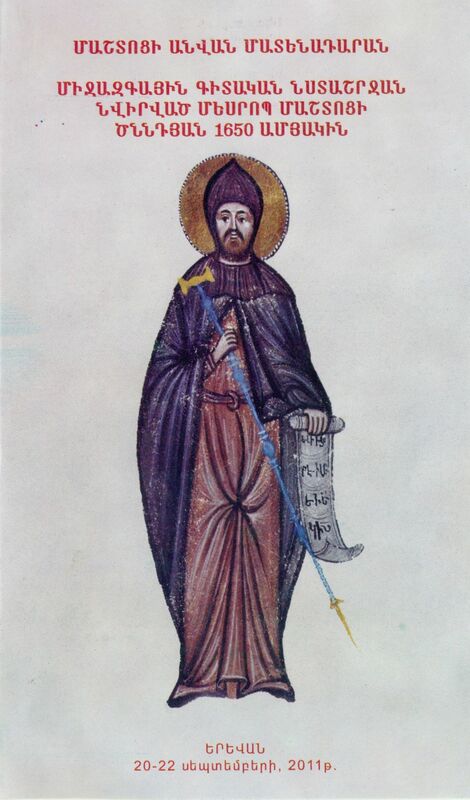 At the full plan of conference the specialists spoke about different reports of Mesrop Mashtots’ life, full works, historical time period, invention of Armenian alphabet, 5th century bibliography and manuscript science. 23.10.2009 - On October 20-22, 2009, “Matenadaran” the Scientific Research Institute named after Mesrop Mashtots celebrated its 50th anniversary by holding an International Scientific Session in Yerevan. The 50th anniversary celebration dedicated to "Matenadaran" the Scientific Research Institute after Mesrop Mashtots took place in Armenian National Academic Theatre of Opera and Ballet after Alexander Spendiaryan. The president of Armenia, Serzh Sargsyan, gave a celebratory speech. The artistic celebration at the anniversary gathering started with a film by movie director Ara Shirinian dedicated to the Matenadaran’s 50th anniversary. 15.10.2008 - On October 9-11, 2008, the Matenadaran celebrated the 90th birthday of Levon Khachikyan, the founder director and academician of the Matenadran, with an international scientific conference dedicated to his outstanding and scientific rich heritage. Over 40 armenologists from the United States, France, Italy, Russia, and Armenia have read various reports of his rich life, scientific activities and researches. The meeting, led by Sen Arevshatyan, was held in the Grigor Narekatsi concert hall of the Matenadaran. During the opening speech, Director of the Matenadaran, Hrachya Tamrazyan, noted that L. Khachikyan was an innovator in almost all areas of Medieval Studies. His Holiness Aram I Catholicos of the Great House of Cilicia sent a blessing letter to the conference presented by Bishop Shahan Sargsyan. Congratulatory messages were also sent on this happy occasion by the following places and authorities: National Academy of Sciences of the Republic of Armenia presented by Vladimir Barkhudaryan, Valentina Calzolari (Head of the International Association for Armenian Studies) presented by Aram Topchyan and the message of His Holiness Vazgen I, Catholicos of All Armenians (to L. Khachikyan’s 60th birthday in 1978) with congratulations and thanks to the people for remembering L. Khachikyan’s great works. 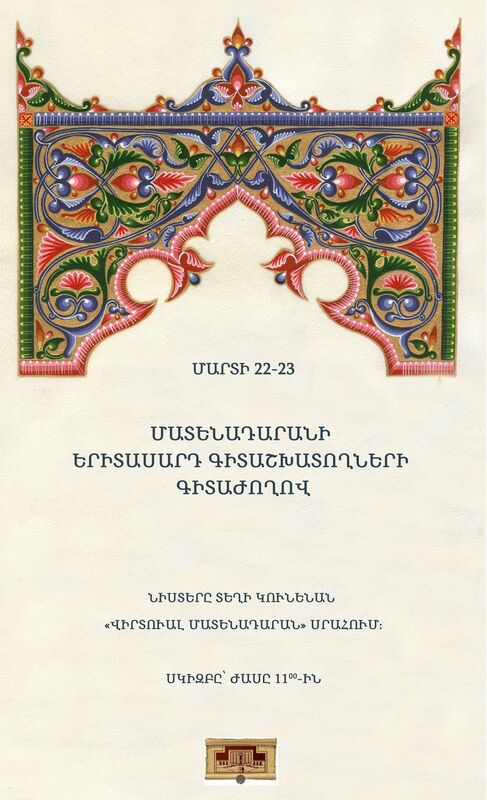 24.11.2007 - On November 21-23, 2007, Yerevan’s Mesrop Mashtots Institute of Ancient Manuscripts held its 30th scientific session. The participants of the scientific session were not only the research fellows of the Matenadaran, but also scholars representing various scientific institutions. The Director of the Matenadaran, Hrachya Tamrazyan, in the opening speech noted that the conference was not important merely for the report of the work done over the years, but for the large presence of youthful participants as both speakers and listeners and that presents the scientific generation’s image. Academician S. Arevshatyan of the National Academy of Sciences of the Republic of Armenia summarized the session’s works.